« Homepage / Food and Healthy Eating / Recipes / "Sautéed Catfish with Louisiana Shrimp and Jalapeno Slaw"
To cook catfish filets mix flour and cornmeal together. Season catfish with salt and black pepper (a little cayenne too) and coat with the flour mix. Get the oil hot in a large sauté pan and cook catfish for about 4 minutes on each side over medium to high heat. To make the slaw, chop up the boiled shrimp (peel them first) and mix with the slaw vegetables. For the dressing mix everything together except for the oil. You want to whisk in the oil slowly so that it will emulsify (come together). Mix the slaw and the dressing and serve along side the catfish. 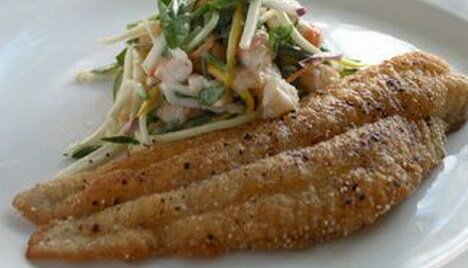 Here you can write a comment to the post "Sautéed Catfish with Louisiana Shrimp and Jalapeno Slaw"